Q: I've read that lime works well as a stabilizer with soil mixes that have some clay content, and that they shouldn't be too sandy. We've got a really wide variety of soils available to choose from. Approximately what percentage of clay is ideal to have in a soil that will be stabilized with lime? A: I have used lime with straight sand, and it actually has hardened just fine. Q: I would like to use existing site material, a heavy clay, without amendment. Is this feasible? A: If you use heavy clay like this, the real danger is that it might expand if it gets wet, or contract if it gets dry, so the challenge would be to keep it from taking on water. You wouldn't want to fill the bags with damp clay, since it would shrink as it dries, or it could provide moisture problems if it is left damp. I would only use dry clay in situations where you were absolutely sure that it would remain dry. Ideally you would only want about 30% clay to 70% sandier soil. Q: How do I figure out how many tons of fill material I'll need? A: Each standard earthbag will hold close to 100 lbs if really full of earthen material, so you can multiply the number of bags by that for the tonnage. Q: I'm preparing to build an emergency shelter using the CalEarth book and DVD and plan to use clay & sand mixture from my property. I understand the ratio is important so my question is: What is the correct ratio and where can I get a soil sample analyzed? The instructions mention keeping the soil moist when filling the bags, but not how moist. I'm puzzled. I'm 81 years old and am really enthused about this project. A: With earthbags, the exact proportion of clay to sand is not nearly as important as it would be with adobe or rammed earth construction. Anywhere from 5 to 35% clay should work fine; ideal might be 15 to 25%. You can figure out the relative % of your natural soil by doing a jar test. Fill a clear glass jar about 1/3 full of the soil, then add water to nearly the top and shake the whole mixture vigorously. Then let it stand for a day to settle out. Eventually the solids will settle to the bottom and the water will be fairly clear on top, with perhaps any organic material floating on that. On the very bottom will be the heavier aggregate, then above that the courser sand and then finer sand, and finally on the very top will usually be a clearly marked line of clay. Then you can compare the amount of each layer to determine the composition of your soil. You want the soil just moist enough so that it will compact and stay in a ball if you squeeze some in your hand...you don't want gushy mud. Q: What parameters make for good earthbag fill? Here at the office we often talk about, 'select fill' and 'general fill'. I wonder if either would be suitable bag fill material. Are there any specific recommendations for good fill? A: The best fill for earthbags is similar to soil that can be used for making adobe blocks, cob, or rammed earth walls, although for earthbag construction there is more leeway for the ratio since the bag will help consolidate the material. In general soil that is between about 10% to 35% clay, with the remainder primarily sandy aggregate works well. When filling the bags you want to moisten the soil just enough that it will form a solid block after being compacted, but not so much that it will weep water. Once the compacted soil dries it will be quite hard and brittle. Q: The northeastern Ohio (USA) area where I live has a considerable amount of clay in the soil. Digging down just a few feet often reveals one- to three-foot layers of it. I've seen both red clay and white. Would this be suitable for earthbag construction? If so, what sort of preparation would be required prior to loading it into tubes or bags? A: Usually it is recommended that a mix of about one third clay with the rest sand is best for filling the bags, because the straight clay has a tendency to expand or shrink, depending on its moisture content and the sand tends to stabilize this. Q: What kind of fill material do you need (clay...)? A: You can fill the bags with a variety of soils, including with some clay, but it is probably best to not use more than about 30% clay so the material doesn't shrink or expand with moisture. Q: You used volcanic rock material to fill your bags - I don't think that's available in the UK. Is there an alternative - or is the answer just earth? A: Most earthbag building has been done with earth from the site, or I've heard of crushed shells being used. The advantage of the scoria is its insulative properties, and light weight. If enough insulation were used on the outside to insulate the structure, then dirt might make a comfortable dwelling in extreme climates. Q: Can you tell me how well (if at all) earthbag works with topsoil? Or does this have to be the clay/sand/gravel? A: There are various opinions out there about appropriate fill material for earthbags; some feel that only a sand/clay combination is appropriate, because this will harden into a monolithic block when it dries. I am of the opinion that you can fill the bags with almost any kind of mineral material, whether it "sets up" or not. The key to this is making sure that the integrity of the bags is not compromised, either during construction or over the life of the building. This means that you need to be careful to keep the sunlight off the bags as much as possible during construction, and make sure that a good plaster is maintained over the bags. Another thing to be careful of is to make sure sharp rocks will not puncture or tear the bags...or that organic material will decompose in the bags. In some circumstances, pure sand is not advisable, since it can shape-shift and cause instability, especially in domed structures. Q: The problem we face is that you have to separate the earth from the organic layer and then pass the earth through a mesh to obtain the smaller grains which separate from the rocky type mass. Lots of material seems to get wasted in such process and I have never-ending piles of earth lying on different locations around the hole and where we mesh the material. If you don't have a machine to do this job and only count with manpower (like in so many places where we want to encourage such constructions) this task is a rather long and a tiresome one. A: All of that sifting and screening is not necessary in my opinion. Small stones in the mix will have no adverse effect. Even small roots will not really be a problem...just avoid large stones and most organic material. Q: I live in upper east TN...my soil is very dark rich loam...will this work in the sandbag? A: Virtually any soil can be used in earthbags, but it is best to avoid heavy clay soils or fine, slippery sand. As long as you remove most of the larger rocks and organic debris, you should be fine. 1) Wait for the right moment, when it's "just right", neither too wet nor too dry, i.e. dry enough to bag but not so dry that it won't cohere, and for that I just have to experiment. 2) Perhaps it's not necessary for the dirt to become a hard block. Before it dries too much, it becomes pebbly. If it's almost dry but still pebbly, is that okay as long as it's packed firmly? In that case, I imagine it would be sort of like the seashell stuff that I've seen on your website. 3) What about bagging it and laying it when it dries just enough to form a pebbly texture and then wetting it down with a hose when I have a course laid, then tamping it to help it form a firm block? A: The soil that you describe obviously has quite a bit of clay in it. Clay is not the ideal soil for bagging, for the reasons that you give, and also some clays are very expansive when damp, which could affect the stability of your wall over time. Some clay is a good thing because it will bind the courser grains of soil together, but ideally there would be no more than about 30% clay, and the rest a sandier soil. For a garden wall it may not matter much if it expands or contracts a bit over time, in which case you can do your bagging whenever the soil is easiest to work. The main likely problem will be some cracking of the plaster you put over the earthbags to protect them. To avoid this possibility you would need to either mix some sand in with your clay (which is obviously a lot of work) or have some better soil trucked to your site. Q: I recently acquired a .50 acre parcel of land in southwest Florida. I've been wanting to build an earthbag home for the longest time. Iis half an acre enough to build a 3 br/1.5 bath earthbag home, taking bag fill from the actual land? A: The best fill material for earthbags in Florida would be some that is a combination of both clay and sand, in a ratio of about 1 to 2. If your property has these ingredients, I'm sure that your half-acre would suffice; it doesn't take much land area, especially if you can dig down vertically to access it. Q: I'm soon starting a project in Mexico, but I'm having a problem regarding the soil mixtures I should use for the wall. Accordingly to what I've read, silty soils should be avoided. The problem I'm facing is that almost all the soil in this region is made of something near to 85 % silt and 15% clay resulting in very unstable walls. Trying to import good soil will be expensive due to the transportation fees. Could I still use this soil mixture or is it simply out of question? A: I suspect that your local soil would work just fine, especially if you make sure that it does have that clay content. I suggest that you run some tests with packing some of your moist soil in a few bags and see if it hardens into a reasonable solid block. This is more important if you are building domes, and less important if the walls are vertical. Q: I'm testing bags for my construction and my soil is nearly 100% clay. I trucked in some sand and mixed an experimental bag with 1/3 clay soil and 2/3 sand. I mixed it dry in a wheelbarrow and broke down the clay as small as I could but most of it still stayed in small clumps. I mixed with water and filled a test bag, tamped it down very well, and it's been sitting there for 3 days. The bag weeped some water but not very much. When I press on it, it still feels more like sand than adobe. Should I mix a different ratio of sand to clay, pulverize my clay into finer dust, or just keep waiting and hope this bag eventually sets up correctly? A: I suspect that your test bag will eventually harden up just fine, but it might take awhile. If water was weeping out of your mix, it may have been too wet in the first place. A: (Quentin Wilson) Just use the soil you have. The problem with too much clay is that sun cured adobes crack. Since you have the soil in bags, cracking is not a problem so you don't need to make the job any harder than it is. Any clay that oozes through the mesh will just help stick the bags together. Assuming that you are using the dratted woven polyolefin or polysomethingelse bags, they have such a low coefficient of friction that keeping them aligned as wall go up is troublesome. The oozing clay goop will help. Being old fashioned, I prefer hemp, jute or cotton bags. Don't worry about clumps. Moisture will suffuse throughout the material over several hours or days as it slowly dries. If that seems sleazy, let the soil sit in a pile for a week or two that you keep damp. Nature will do the work for you. If you come back in 10 years and for some reason (such as solar degradation when plaster is gone) you will find that the bag contents will hold up on their own even if it does not seem to be a perfect blend in the beginning. A: (Michael G. Smith) Sounds to me like you are either using too much water or not tamping hard enough. No matter what's in the bag, it should feel very solid once it's been compacted. Q: My concern with road base is based on what I hear about some having clay and other types of road base not having clay. The people at the recycle yard could not really tell me much about the contents. I have been adding clay to the recycled fines and that works well, but the nail split the sample in a few pieces. A: Driving a nail into most earthen blocks will crack them. I think the deck screw idea tends work better (at least according to our adobe expert). "Road base" is a generic term that applies to a large range of specific soil compositions, depending on the locality, so your addition of clay may make the difference with how well your particular material consolidates into a solid block. The thing about earthbags is that the fill material doesn't necessarily need to form a solid block, since the bag material itself will hold it all together. Q: I am going to build an addition to my main home. I am using earthbags to build the walls. I am going to build a rubble trench. I am going to fill the bags with crusher fines from a local rock quarry. I guess the fines are a bit larger than ag-lime. Would ag-lime work as filler or should I stick with the fines? Should I mix some sand in with the fines or can I use straight fines or straight ag-lime? The walls will be load bearing. The addition will be round with a masonry stove in the center that will be load bearing as well with timbers running off masonry stove to the earthbag wall. A: As for fill material, the ideal is something that will solidify after compaction, like a moistened adobe soil would. Adobe has a combination of about 1 part clay to two parts sand. Your crusher fines might do this just fine, or possibly also the ag-lime, or even a combination of the two. I suggest that you run some tests to see what works best. Make several mixes, moisten them slightly, place them in small bags, tamp them well, and wait for a week or two and see which ones remain solid when dropped or handled. I doubt that you would need to add sand to the fines, but they may need some added clay to bind them better. Q: I tested 2 bags of soil, one with dark top soil and another with the more yellowish, rocky sub soil. Both were damp and tamped and left in a shaded place to set. Both are now rock hard except if I push on the edges it crumbles a bit inside of course; with bags on top and plaster it wouldn't do this. Any way I can't decide which of these soils is going to be better? A: I would say that either of your soils would do fine. Often, the darker soils are richer in nutrients and better for gardening, so I would lean toward the other. Q: Anyone been building earthbag in heavier soils? I just wish we had a way to test and predict more accurately... To tell one person, you better add some sand, another it'll be ok. The CEB info I have says 1/32 inch shrinkage over a foot length is acceptable. That's about 0.2%. I am certain that earthbags can tolerate much more. But how much more? And how will lime plaster perform on a heavy clay base? Would it crack? At least if one uses the same clay for plaster it should expand uniformly with the base? A: I'm afraid that we just don't have the database to answer your questions with authority. I'm sure that people have used all sorts of soil in earthbags by now, but how successfully it is hard to say. All we really can go by is from our own experience and knowledge. The needs of CEB, adobe, cob and rammed earth are well documented...but only pertain to earthbags in a rather general way. I believe that unless heavy clay used in earthbag building is very expansive (and this varies a lot with different clays) and it gets soaked through after it has cured initially, that problems are not likely to appear. An earthbag wall that is properly made, with a reinforced plaster, is not going to fail even if the clay in the bags is riddled with cracks. The exterior plaster is more likely to expand or contact with moisture content because of its exposure to the elements. For this reason, I would not recommend using a heavy clay earthen plaster. Lime or standard earthen plaster is more likely to hold up well. Q: There's grass growing out of the earthbags. Is this a problem? A: Adobe and cob often sprout little seedlings, but as they cure these die off and actually help integrate the soil to some extent I have heard. Obviously you don't want very much organic material that will decompose and cause voids though. 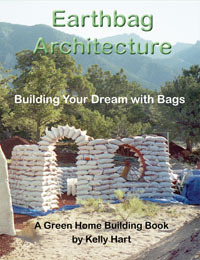 Q: I am wanting to build a vertical wall earthbag home. The property I have is in central/southern Indiana and it has quite a bit of clay in the soil makeup but nowhere near enough to the 70/30 sand to clay ratio I have heard about. Is it possible to use just the soil that I have to fill the bags or would I need to buy truck fulls of sand and clay (if even possible)? A: While the 70/30 ratio might be ideal it is not critical. Some soils with as little as 10% clay can work fine. I suggest that you do a trial earthbag with the native soil, moistened enough to compact when tamped, let it cure until dry, and see if it hardens into a solid block or not. In Indiana you might rather use a more insulating fill material, such as crushed volcanic stone, perlite, or rice hulls. Q: I'm looking for the best clay available, but think I will have to truck that in. A: Sometimes you can find clay by digging down a meter or two. Q: I am in Utah, 6,000 ft. altitude, building a geothermal greenhouse. I am using earth bags for 3 walls, 4 ft. underground, then pushing soil up against walls, so that only the roof is exposed to light. I only have sandy soil. Would it work to use 90% sand, 10% bentonite clay? Or possibly 10% cement, in the bags? A: I suspect that either of those options would work; you might test the sand/clay mix, moistened and tamped into a bag and let it dry to see how solid it becomes. Another option might be to use the sandy soil directly without amendments, but incline the walls outward against the berm. I did this recently in an underground pantry and even dispensed with the use of barbed wire, and it has worked just fine. Q: As you know, the Pacific coast of Latin America suffered a lot because of the waves. In our land, the sea came in different days throwing an enormous quantity of sand ... disappearing the pool, certain constructions etc. We are a small hotel, started 12 years ago and still on track ... with not enough clients. I would like to experiment with building 1 or 2 small earthbag buildings/cabins ... to have more space and a new unknown option for our visitors ... and a way to use all the sand we have to move to uncover the hotel. Is it possible to use sea sand for earthbag building (because of their composition and the concentration of salt? If so, how can we stabilize the sand in the bag. A: I'm sure that you will be able to use your extra sand in some way to build your cabins. I think that if you build vertical walls that are curved, like making a round house with them, and are careful to use barbed wire between the courses of bags and periodically pound in vertical steel bars that are also embedded in a reinforced concrete bond beam at the top, that you can use the sand as it is. I did something like this about 15 years ago with the structure shown here, and it has been very solid ever since. You need to be very careful to keep the bags covered from the sunlight and apply a good cement or lime based plaster to protect the bags. Some people say that sea sand (because of the salt) don't work with cement ... for construction they always use river sand. Mixing salty sand with cement is not a good idea, but if you don't use the cement with the sea sand you should be fine. For the plaster use river sand. And be sure to use some mesh in the plaster, something like fish net works. Q: Our soil is chalky and I would like to know if this is suitable for earthbags? The whole site is on chalk and in digging into the bank we will be effectively excavating chalk. Are you aware of any plans for buildings that have utilized chalk to create a sustainable home? A: A wide range of soils can be used successfully with earthbags. It partly depends on the design of the building how well any given soil will work. For instance, very sandy soils can be used for small vertical, curved walls, but not for domes. Your chalk sounds like it might be similar to limestone fines that have been used for earthbag building. My suggestion is to run some tests, using moistened chalky soil that is compacted into bags and see if it forms a good solid block; if so, it is a good candidate for many earthbag designs. Q: Here in New Zealand we have difficulty disposing of used tires and so there are mountains of them lying around. There are some recyclers chipping these tires into small chunks to be used for horse racing tracks etc. Has anyone tried using this kind of thing as part of an earthbag mix? I imagine it would have a reasonable R rating, and provided you didn't use too much it shouldn't add to much risk of burning. A: I have not heard of anyone using shredded tires to fill earthbags, but this does seem possible to me. Some people are concerned about off-gassing with used tires, but the Earthship people assure us that tires, when encased in plaster present a minimal risk. If the tire chips created enough air gaps around them, then this might lend some good insulating value. Q: I own a small sandy piece of land almost 5 blocks away from the Atlantic shore in Uruguay. What about salt? Does the salt deteriorate plaster? What would be the cheapest material to stabilize and harden the sand? A: The salt in the sand won't affect the fill material, but it is not good for binding with cement, so cement-stabilized fill or cement based plaster would be a problem. The best material to stabilize the sand would probably be clay soil. Q: I am planning a 6m meter diameter circular domed house. The base materials will be similar to the sand castle of Steve Kemble (coral reef white sand with 3-5cm bits of coral inside ). I don't plan to use ciment. Do you have some piece of advice for me? A: I recently spoke with Steve about his coral/sand filled bag project, and he is still quite satisfied with how it turned out. Of course his was basically a vertical wall foundation for another type of construction above. With a dome you want to make sure that the fill compacts firmly and doesn't shift over time. So you might run some experiments with your local fill and make sure that it will do that. If it doesn't you might want to add some clay or lime to the mix to make it "set up" firmer. Q: We made the jar test and we have no clay at all; it's mainly sand from dunes. We really don't want to use cement to stabilize the sand bag because of the environmental implications on it's production process. We have read that lime works better with clay, but it's almost impossible to buy clay where we live. In which proportion do you think lime will work well with these types of sand? A: You might try as little as 5% lime, but I suggest running some tests to see what works. It really depends of the exact design how solid the fill needs to be. Vertical, curved walls can use much looser fill than straight walls or domes. A: Synthetic fiber could be added to earth to increase its coherence, but with earthbags this is likely unnecessary, since the bag material keeps it all together well enough. Such fiber would be more useful with adobe, cob or rammed earth where the earth is exposed and not contained.